Diary Can get some nice “biltong” in Kruger though…Biltong is a kind of dried spicy meat that makes the perfect all day snack for us growing prop forwards. Bought some springbok biltong and was regarded like a mass murderer by Tess our resident vegetarian (the only vegetarian I know who doesn’t eat vegetables), but Ella said “Ah well Dad, it would have been butched by a lion anyway” and Polly who in her inimitable way said “MMMMMM!!! Tastes just like chicken!” There are about 689,312 rules to be obeyed in the Kruger, you mustn’t breathe after 8pm in case you disturb the other campers, you are forbidden from mounting road kill on your bull bar (although you can buy rather fetching real zebra skins to mount on your bonnet),you mustn’t drive off road, you must not, under any circumstances even put a toe out of your vehicle. Of course the Rawlings family have a strong anarchic streak in them and we are slowly going through the rule book checking them off. Unfortunately for Clare she was caught out of the car which supposedly attracts a fine of 500 rand (about £40) We had eaten lunch in the Land Hovel (crumbs everywhere) and Clare had nipped round the back to put the cheese in the fridge, when a ranger came over the brow of the hill and couldn’t quite believe his eyes to see someone so flagrantly abusing the rules. He took her round the back of his car and showed her the rule book (Rule 72) and I heard Clare arguing away as only she can for about 10 minutes. I was the holder of the money this day and I already had my story sorted out…”What??! 500 Rand…Take her away, she is a very, very naughty woman and should be punished and give me a ring to pick her up after she’s served her sentence!” Then, a very strange thing happened…..Clare stopped talking and took her bollocking like a man (woman? 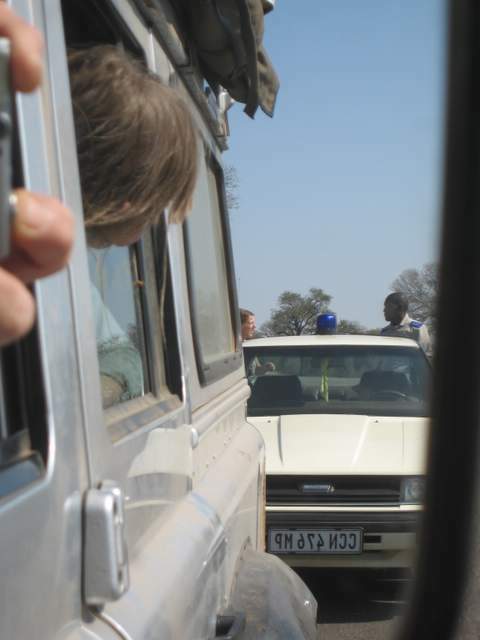 )…I was shocked and nearly hired the ranger on the spot to accompany us on the rest of our trip…anyone who can make “Klaxon Clare” shut up for 5 minutes must be powerful beyond belief. Anyway, he didn’t fine her and retreated exhausted from such a stimulating, but tiring intellectual argument. Clare spent the rest of the day bemoaning the whole system and pointing out minute inconsistencies in his argument such as “you are allowed to get out near rocks as there are no dangerous animals near rocks!” Pretty good afternoon as at least she wasn’t whingeing at me!